As mentioned earlier, I recently moved to Toronto (four months ago). I was lucky enough to find a cozy place to rent in Little India. And I must admit it was love at first sight! This little neighbourhood is full of great little spots to keep occupied either shopping, eating or entertaining. After moving, I realized that the main strip of Little India is actually home to many Indian, Pakistani, Bangladeshi, Afghan and Sri Lankan restaurants, cafés, videos/DVD stores, clothing stores, electronic goods and home decor stores. 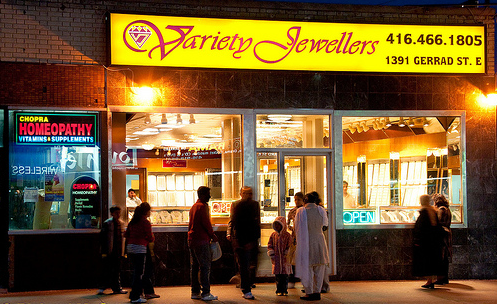 Even more interesting, along with Jackson Heights in New York and Devon Avenue in Chicago, it forms one of the largest South Asian marketplaces in North America. Very eclectic Gerrard St. E.
Often people (ahem, mom) have told me that I am an old soul. I like simple things, like sitting in my backyard and reading a good book while having a glass of wine. This is where the Gerrard/Ashdale public library comes in handy. This is a great library because it offers one thing that makes it invaluable in my books (pun intended) – they stay open “late” three times a week (8:30 p.m.!). Also, the people working the library are as charming as pie, and always offer great suggestions. I recently picked up Him Her Him Again The End of Him and have been enjoying it very much. Another great thing about my ‘hood is the incredible variety of restaurants that are along a two kilometer strip. 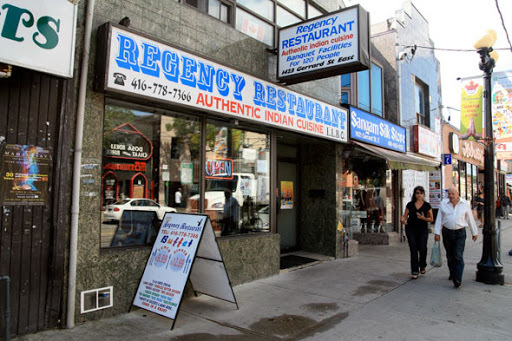 I discovered the first of many Indian restaurants, the Regency Restaurant on my first night at the new house. Amazing butter chicken and naan. They have an excellent choice of plates on their buffet, and also some tasty tandoori, samosa and pakora dishes on their menu. Don’t let the understated signage fool you – delicious eats inside. After filling up on yummy food I head to Rang Home Décor and see what’s new. They carry a wide range of cute furniture accessories like throw pillows, fixtures and ottomans that are really unique and make any room pop with colour. 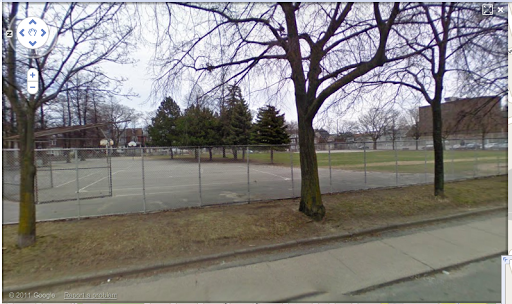 Lastly, what makes my ‘hood the greatest is the Fairford Roden Public School where they have a decent sized football field and basketball court. Can’t find me at home? Take a look on the field or the court and come shoot some hoops with me. This playground is actually really fun, even though it looks gloomy here. Thanks for stopping by my ‘hood – see you in the east end!